The government has formally moved to seize several of Paul Manafort’s assets – including unit 43G in Trump Tower – after the onetime Trump campaign chairman agreed to forfeit various properties and bank accounts in a plea agreement signed last month with special counsel Robert Mueller. In a court document filed on Friday, Mueller asked a federal judge in Washington, D.C., to grant the government “full and exclusive custody and control” over nine assets previously belonging to Manafort. Three of Manafort’s New York properties and four bank accounts are to be handed over to the government “immediately,” Mueller wrote, adding that two additional properties – the Trump Tower apartment and his sprawling Long Island mansion – will need to change hands by October 20. 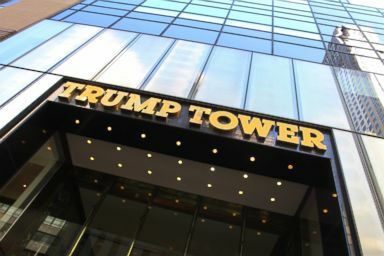 In this file photo shows the exterior of Trump Tower skyscraper at 5th Avenue and 56th Street, Aug. 24, 2013, in New York City. Manafort entered into a plea agreement with Mueller’s team in September in the Washington case, agreeing to admit guilt to two counts of conspiracy against the United States related to financial crimes, witness tampering, and foreign agent registration violations. Manafort also agreed to cooperate with Mueller as he and his team of prosecutors continue to probe Russian meddling in the 2016 election. As part of the deal, Manafort admitted guilt to ten related federal charges in Virginia that a jury was unable to reach consensus on at a trial in August. The jury had already found him guilty on eight charges in the Virginia case. The agreement marked a turning point in the Mueller investigation, providing prosecutors a first-hand account from one of Trump’s most senior former campaign aides – someone privy to the inner workings of the campaign during critical months in 2016. Manafort also participated in the now-infamous Trump Tower meeting, in which a Russian lawyer came to New York and met with top Trump aides during the campaign after intermediaries promised “dirt” on Trump’s Democratic opponent. Manafort’s sentencing has not yet been scheduled.